The book is written through the eyes of 2 women, Annie and Nora, who have been best friends since they were little. As the reader, you get alternating views on a school year in their life at a small boarding school in New England. 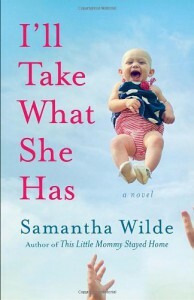 I enjoyed the different points of view but felt that some of the book was a little preachy when dealing with feminism and stay at home vs working moms. A quick read and I think behind the story is a great point that we tend to want what we think other people have without knowing what is going on behind the scenes.